My movie picks for the year 2010. I have a few I still want to watch, but this year I’m closing the window before the Oscar picks come out tomorrow morning. Not even sure why I’m doing that, but at some point you just have to move on. True Grit — Another adaptation takes my #1 spot this year. I never saw the original with John Wayne, nor have I read the book, but I loved this movie. The ornate language, the freaky characters, the plucky little girl. All of it wrapped around a morality tale about retribution. The Social Network — I don’t like cynical movies — And this movie is deeply cynical — but something about the dialogue, the pace won me over. It had a buoyant quality that I really liked. Inception — An science fiction action flick, wrapped around a heist. I saw this with my 12-year-old son and just really enjoyed every minute of it. For weeks after we saw it, we kept egging one another on with the “BWAAAA, BWAAAA!” fog horn sound from the soundtrack. Scott Pilgrim vs The World — Wow, an outrageous coming-of-age story built around some sort of mythic comic book battle to the death. I was so disappointed Scott Pilgrim did so poorly at the box office. The Kids Are All Right — A family drama comedy Holly and I really liked. Mark Ruffalo was fabulous. Knight and Day — Remember Tom Cruise as the fat, bald Les Grossman, dancing lewdly in Tropic Thunder. Knight and Day is like 120 minutes of that. With Cameron Diaz. In a bikini. 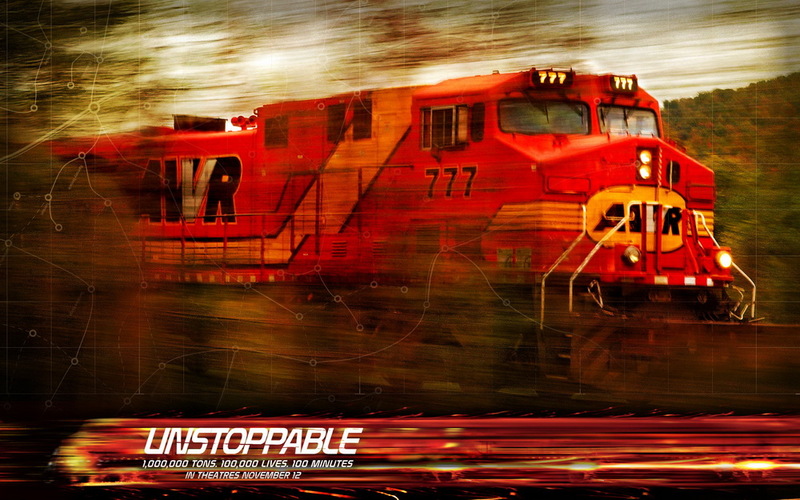 Unstoppable — A runaway train, a grizzled old train man, a new kid, a clever boss, and a bean-counting upper management guy. Predictable, but tense and good fun. 44-Inch Chest — A bunch of gangsters get together to deal with a little domestic spat among one of their own. Gritty and realistic, but so sad. Favorite image from the movie: Ray Winston running through the night, trying to escape the memory of beating his wife. There is something vaguely feminine in the way he holds his hands off to his sides, like big men do when they run. Harry Potter and the Deathly Hallows Part 1. — Having watched the three leads grow up, I can’t help but root for them with each new movie. Each of them are turning into splendid actors, but I especially liked Rupert Grint in part 1. The Book of Eli — I expected zombies, but I found myself surprised and delighted with this story. I know the guy who wrote the screen play for this — if you consider occasionally being mocking me on the internet, the same as “knowing” somebody — so maybe I’m just biased. But really. This movie is totally badass. I loved all the shots of rural Pennsylvania and its mill towns. I thought Washington and Pine were excellent together. Tony Scott studiously avoids any sort of deep, thoughtful stuff, but offers instead a tense, situational thriller that hits a lot of the right notes, with the usual cast of characters (Old Timer, New Kid, Stupid VP Bean Counter, Smart Boss). The few obviously stupid parts (we can’t afford to make Chris Pine a dirty rotten wife beater) are more than overshadowed by how well it all comes together as a whole. Go see! The setup of this movie is simple: Scott Pilgrim is a lovesick twenty-something Canadian, still wavering from a breakup that happened months ago, who must defeat seven evil exes to date Ramona, the hottest new girl in town. It feels like one of the ancient classical quests where the hero has to accomplish some tasks to win the fair maiden, but that’s where the similarities end. This is a coming of age story, not a hero’s journey. You think Scott is doing battle with seven evil exes, but the real battle for him is with all the things he had already brought into the relationship—not only the relationship he is having with Ramona, but with every relationship he’s ever had in his life. Michael Cera is perfect for Scott Pilgrim. He looks like someone who lacks self-esteem, with little self-confidence. Listen to him agonize about his goofy hair! Squirm as he opens the movie by starting a relationship with Knives, a high school girl. Watch as he meets Ramona, quickly realizes his mistake with Knives, but fails to take any decisive action. Yet Pilgrim has all these wonderful talents—mad gaming skills, musical talent, Kung Fu wire fighting. On some level it doesn’t even matter if his movie skills map to any real life skills—he’s meant as an everyman schmuck who has some good to offer the world, but must first find a path to confidence from within himself. 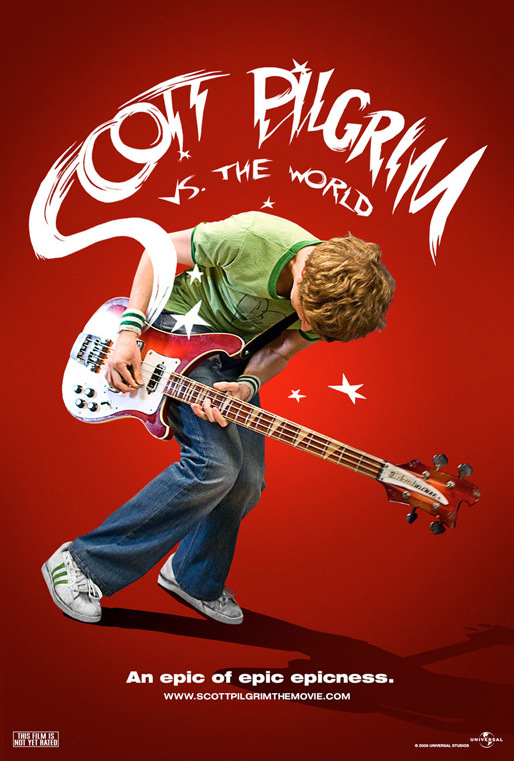 If this were the Oprah show, Scott Pilgrim would have to learn the “Greatest Love of All.” Sing it Whitney! This movie depicts what being in a relationship is like in your late teens and early twenties. All the girls you can get are dull and boring. You only pine after the ones that dump you. Haven’t we all been in the same desert where Scott finds himself? Here he pines for the lovely Envy Adams, the big rock starlet who cruelly dumped him. Envy’s cool quotient is so high Pilgrim may never recover—until Ramona, the next mysterious American cutie comes along! Who doesn’t know the allure of the girl from out of town, who isn’t afraid to mock you or your friends, or changes the color of her hair every week. But Ramona brings more to the relationship than her many hues of lovely hair: it’s how she comports herself in the relationship with Scott that’s important. Relationship-wise, Ramona is possibly the healthiest of all people who animate this movie—compare her aloofness with Scott to Knives constant mooning over him. Compare Ramona’s ability to stand on her own financially and emotionally to Scott’s leaching off his gay roommate, or his endless pining for Envy. The one surprise in Ramona’s healthy behavior is her coldly dumping Scott for no reason and with no warning, but then we learn this is the result of Gideon having the upper hand (I can’t get him out of my head — No, really!) with the microchip attached to her head. This was my least favorite divergence from the book, but it wasn’t a deal killer for me. Ramona is a really great character. In the age of 3D movies, this picture is a two dimensional visual feast. I really enjoyed it, but it does suffer from some pacing problems, a sort of plodding second act. But for me, this was more than made up for by the charming ending. Jeff Bridges is great, but this is one slow movie, with very little that’s new or interesting. I am sure I have seen this story many times before, but this time Jeff Bridges is in it, singing C&W songs. It’s hard to believe Maggie Gyllenhaal got an Oscar nomination for this. She’s not terrible, but she didn’t seem to bring much to this role. I have not read the book, but I got the sense that there must have been some dramatic tinkering going on with Bad’s alcoholic bottom. Was it softened up to make him seem less reprehensible? If so, that was a mistake. Maggie’s reaction seemed somewhat out-of-line and threw the rest of the movie off the rails. The one thing that surprised me was Robert Duvall – The whole movie was by the numbers, but his was the one role that offered a pleasant surprise. I couldn’t figure out how his character functioned in the story until it was revealed (and it wasn’t like it was a big Hollywood reveal, but more like I was surprised that his character was the one playing that part, a crucial role for these kind of films). I thought it would be Maggie or the agent guy on the phone. And for all the singing that Bridges does, I thought Duvall’s little spoken word song was the most poignant of all. Good call on adding it to the closing credits. Book of Eli surprised and delighted me. 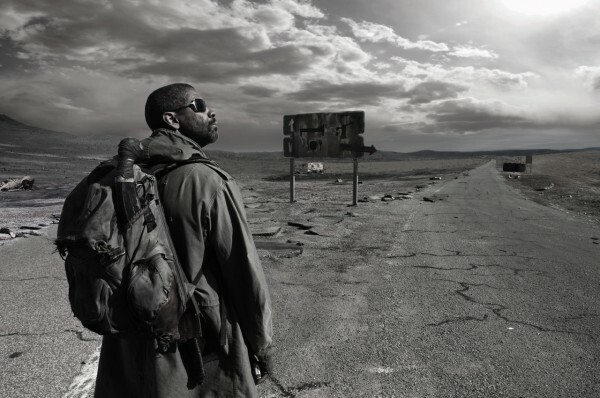 Understand: I love me some postapocalyptic, dystopian, nightmare movie. Book of Eli has plenty of the requisite violence, flair, and visual style this sort of movie calls for. But it’s also a thoughtful movie about the power of faith, and the way religion can be a saving grace in one man’s life, even while it drives another man to war. The last 15 minutes had me holding my breath for fear the movie was going to careen of its tracks, but it holds up to the end. Just a brilliant ending that makes you want to watch again. I know (kinda, sorta) Gary Whitta, the guy who wrote the screenplay for Book of Eli. We posts on a message board with a bunch of other writers and geeks. So naturally a bunch of the guys in my area got together to see the movie on its opening night. Meanwhile, there were similar groups doing the same thing in Rochester, Las Vegas, San Francisco and probably a few other places, too. I love that kind of community. This is an example of the Internet is at its best. My favorite movies of the past year. I still have a few I want to watch, so (thorughout January) I reserve the right to juggle. Star Trek – Wonderful adaption. The best adaptatiotns remain just faithful enough to the source material, but still manage to offer up a few surprises. By far the best Star Trek movie of the bunch, but a potent adaptation in its own right. Inglorious Basterds – Fun to watch, fun to mull over. Once you see it, it’s hard to understand why all WW2 pictures don’t end this way. Now one of my favorite Tarantino pictures. District 9 – I loved the inventive transformation of the main character. An ugly little man becomes a humane alien. Sherlock Holmes – Robert Downey Jr. and Jude Law have a lot of chemistry as Holmes and Watson. Hurt Locker – The most powerful scene shows Sgt James (Jeremy Renner), who has just returned from a horrifying tour in Iraq, wandering through the supermarket with his wife, staring at a wall of cereal, just before he reenlists. Fascinating portrayal of a smart guy who really has no clue what’s motivating him. Avatar – Beautiful movie, engaging if familiar story. Watchman – Bold and original. Julie & Julia – Meryl Streep is so much fun to watch. Stanley Tucci is a joy. Taken – An episode of 24 but with Liam Neeson. I am a huge Sherlock Holmes fan and thought the new move rang true as an adaptation. The few notable divergences (Watson’s wife, Holmes’ boxing matches and his own love interest) seemed acceptable to me. 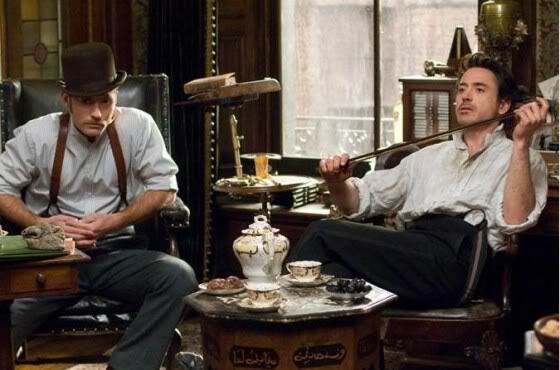 The chemistry between Robert Downey Jr. and Jude Law was excellent, which is all you really need for a good Holmes adaptation. Denby said it reminded him of a screwball comedy, which seems spot on to me. It’s the same thing that made the old Holmes movies with Basil Rathbone and Nigel Bruce work so well. The big difference between the old series and this one is that Rathbone took his part so seriously, which was probably appropriate for his time–most of those movies are thinly veiled WW2 propaganda pieces. This new one is much lighter, with RDJ/Law hamming it up at times. I thought the evil Lord Blackwood’s (Mark Strong) “Di Vinci protocol” scheme was an excellent way to evoke the Victorian era and it’s relationship to magic and the supernatural. Besides Hounds of the Baskerville, I can’t really think of another Conan Doyle story that uses the supernatural in that way, but Holmes use of deduction and reason always looks best in contrast to a supernatural story. I liked Avatar, and I am not even sure why (despite my having a few weeks to think about it). It charmed me. I liked Jake, (Sam Worthington) the broken main character. He’s physically broken (his disability), emotionally weak (easily manipulated by Stephen Lang, the bad marine), and not much of a marine himself (he almost gets himself and his party killed on his first patrol). Sure, the movie moves forward in a predictable fashion, borrowing from many other movies, and doesn’t even offer us a single good line of dialog for posterity (“I see you.” Gah, how awful). But none of that matters. The point is watching a mope like Jake turn his circumstances around. This movie reminds me of Rocky. It’s not like Rocky is good because it was the first sports movie to feature an unlikely underdog who came from behind–it’s interesting because Stallone plays such an utterly luckless, shambling clod who must rise above his circumstances. And none of this takes away from the criticisms people are making about Avatar’s plot, the slim characters, etc. Much of that is true. I wish it would have explored identity with a little more depth and meaning. But it had enough good to win me over. I found it interesting that Jake had to abandon his body to become more human. I hope they do a little more with the plot in future installments. It was also very beautiful. My pleasure., son. My pleasure. 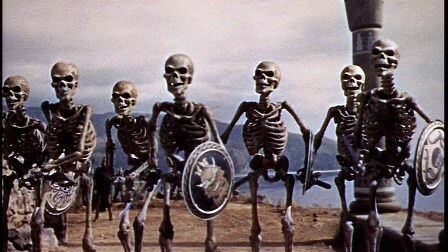 I recently watched the Ray Harryhausen stop-motion masterpiece, Jason and the Argonauts, with the kids. The movie still delivers. The kids loved it. Holly has been introducing the kids to classic movies and TV. I haven’t participated much, mostly because I haven’t been too interested in the picks—wacky old comedies, like Spaceballs or the old Pink Panther. The kids have never enjoyed movies too scary or intense. But if their recent reaction is any indication, some of that is changing. I thought it might be fun to post their reaction to my picks, for better or worse. 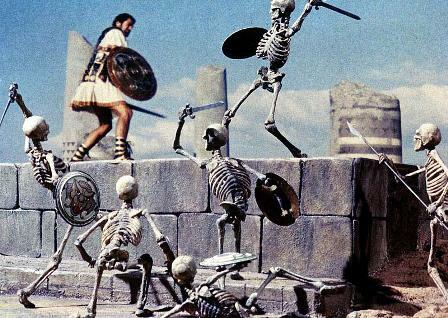 I was astonished to learn that Holly had never even seen Jason and the Argonauts. This 1963 film features some of the most compelling monsters in any film, even compared to modern films with advanced special effects work. I am not sure why this is. I suspect it has to do with the special effects being just real enough to suspend disbelief, but not so real as to make you squeamish. 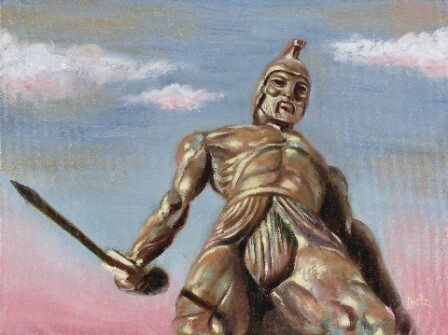 I love the grand finale battle with the skeletons and the first battle with Talos, the giant copper titan come to life. 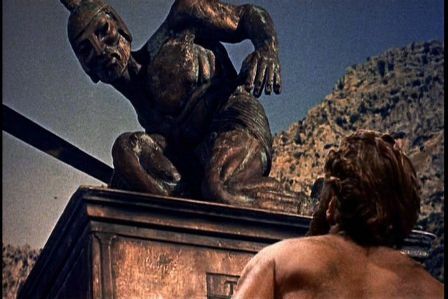 It may also be because the special effects that don’t work so well are cheesy enough to make you laugh—think: Jason’s battle with the multi headed hydra (especially when it has him coiled in its tail), and Poseidon, the giant sea god, who calms the Clashing Rocks. The kids watched with one of their friends. All the children enjoyed the battles and special effects, but Kennedy and Aaron were particularly impressed by the Greek mythology. This is probalby because they’ve been enjoying the Percy Jackson series of books. Their friend hasn’t been reading Percy Jackson and his attention wandered, especially during the scenes featuring Greek gods looking down from on high. There is nothing worse than a children’s movie that makes you feel less hip. Ponyo is the new animated film from Studio Ghibli, the Japanese equivalent to America’s Disney or possibly Pixar. The mastermind behind Studio Ghibli is Hayao Miyazaki, which I guess makes him the Japanese Walt Disney. Miyazaki’s new film made me feel old and creaky, definitely uncool. In contrast, I felt incredibly hip when I showed my kids one of his earlier works, My Neighbor Totoro, which features a wacky cat bus, crazy dust sprites, and some giant wood elf. I hoped to reclaim some of that old magic by taking Holly and the kids to see Ponyo a few weeks ago. Ponyo offers similar nonsense as Totoro, but with a sea theme: a wacky yellow submarine (not nearly as sublime as Totoro’s grinning cat bus), loveable tadpoles, and a crazy old coot who lives in the sea. Somehow none of it worked for me. In Totoro, the fanciful wood elves and cat bus added a pleasent child like element to a story that’s firmly grounded in the real world–the drama of a sick parent from the point of view of a young child. In Ponyo, the plot isn’t grounded in much of anything. Although it’s a beautiful story to watch, I couldn’t make heads or tails of it. The climax involves one five year old marrying another, while the parents watch. In Totoro, the hightened reality seems to describe a spiritual world accessible only by children. In Ponyo, they seem to be trying for a spirit world accessible by children and adults, but it just falls flat for me. A friend of mine, equally flummoxed, called it the best movie about a five year old getting married she’d ever seen. That about sums it up for me, too.